Editor's note: Today’s guest blogger is Chris Williams, Director of IT and Support Services for Chapters Health System, which provides post-acute, palliative, and hospice care to patients in west-central Florida. See what other organizations that have gone Google have to say. At Chapters Health System, the role of IT is to provide software, connectivity and hardware to caregivers so they can spend less time wrestling with technology, and more time caring for patients. Our goal is to make the IT portion transparent to providing superior patient care. Most of our nurses and caregivers are mobile – they visit patients in hospitals, nursing homes, assisted living facilities or in their homes. To best support them, we virtualized our clinical and business software applications, and provide access to them via Citrix XenApp via Receiver. We also make sure our caregivers can stay connected through a Verizon 4G Mifi device. As for hardware, caregivers were using Windows notebooks but boot-up delays, long setup times for new machines, and the bulkiness of the devices were slowing down and frustrating our caregivers. In addition, the devices were hard to manage by the IT support staff. To find a solution, we took a democratic approach and asked caregivers to evaluate four devices: the HP Chromebook 14 for Business, Apple iPad, a Windows thin client, and a traditional Windows notebook. Caregivers rated the HP Chromebook 14 higher than any other device in all areas, including form factor, battery life, ease of use, speed and performance of virtualized applications like Microsoft Outlook and clinical applications, as well as web applications. 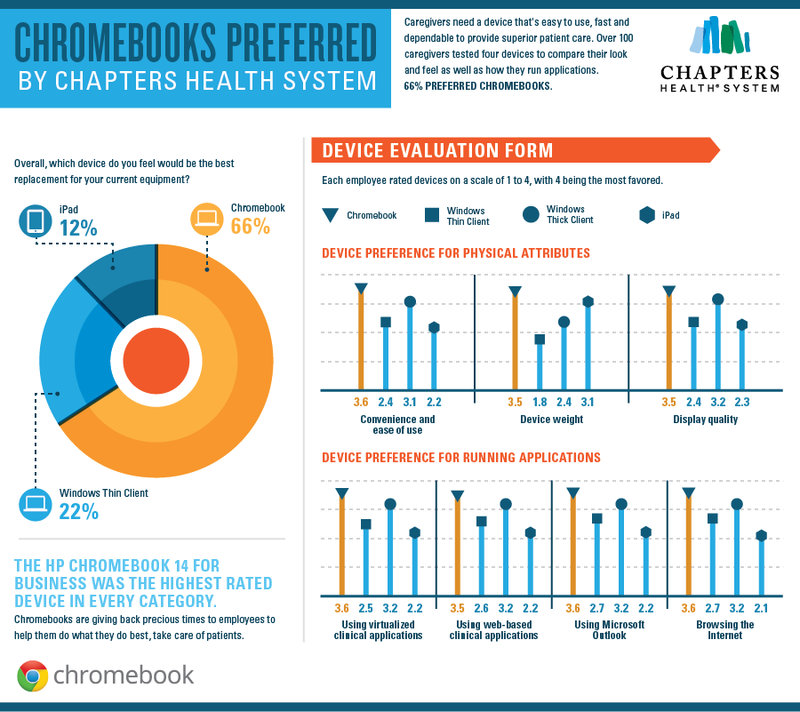 Ninety-two out of 139 caregivers who participated in our study voted the Chromebook as their favorite device for work. Luckily for us in IT, Chromebooks for Business are also the easiest devices to deploy and manage, freeing up our own time for other projects. The biggest change we’ve heard about so far is improved speed. With a traditional Windows notebook, caregivers faced three to four minute boot times, plus multiple logins to Windows, their VPN, and then finally Citrix and the applications. With Chromebooks, boot time shrank dramatically and Chromebooks start up right at the Citrix login screen, so caregivers can access clinical data right away. Speed benefits extend to setup time as well. Some of our supplemental and weekend caregivers borrow from a pool of shared devices, and it took 40 minutes to set up each Windows notebook. With Chromebooks for Business, we can hop into the management console and set up a new Chromebook in under five minutes. Even better, we use the management console to configure access for users so that if they need to borrow a machine we don’t have to get involved at all—they just pick up a Chromebook and log in. Since each caregiver can get his or her specific user experience on any Chromebook, it's easy for the devices to be shared. For additional security and simplicity, we use Chromebook for Business’s Kiosk mode to offer one single application, the Citrix login screen, but we’ll be extending it other web applications soon. We also use the management console to mandate the proxy server for Internet access—a feature that’s built-in to each Chromebook for Business. Chromebooks are giving back precious time to caregivers and their patients. In fact, we’re looking at purchasing many more Chromebooks in the near future so we can extend the benefits to even more Chapters Health employees.